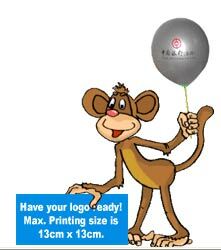 Looking for a fantastic price on Promotional Balloons? As one of NZ’s leading advertising balloon printing companies, Earth First should be the first place to go for advertising and promotional balloons, that are normally used at major sports events, stores and for a range of indoor and outdoor events. Our range of custom printed balloons include printed latex balloons in a exciting colour spectrum . All of our balloon products are suitable for helium inflation. Read more about our advertising balloons custom printed for your company expand your brand today. Second Colour Set up $ 65, plus 3 cents per balloon. Add 3 cents per unit for the larger 12 inch balloons. Express turn around available on Balloons 2- 5 days add 25% to the above prices. Ask us about our many other types of Balloons. Click here for more details on our Printed Balloons and our otherb services that are related to promotional balloons. All product can be used as modelling balloons if required. If you would like further information in regards to larger run pricing please feel free to contact us for more details. We Deliver all balloons New Zealand wide including all main centers: Auckland, Wellington, Christchurch Hamilton etc. Rural areas may inccur addational freight costs. Wholesale Balloon enquires are welcome.